Searching for a Great Dane? 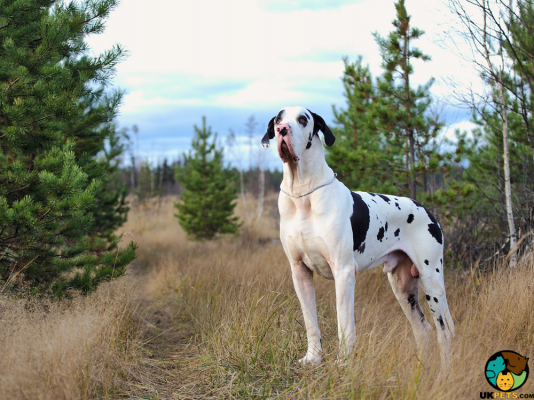 The Great Dane is an imposing working dog with no clear place of origin, as many records about the breed are found in various parts of the world. It is one of the tallest dogs, standing 71 to 81 centimetres and weighing 100 to 200 pounds. With its massive size, the Great Dane is an intimidating figure that instantly offers protection as a deterrent for people with evil intentions. Its size belies its sweet demeanour underneath. This gentle giant is an excellent family companion dog known to seek affection from its family. Will you welcome a Great Dane into your home? Here is complete information about this daunting dog breed that is actually a sweetheart in reality. The origins of the Great Dane is shrouded in mystery as multiple records suggest that the dog breed is found in various parts of the world. It was depicted in artefacts of both Egypt and Babylon, on frescoes in ancient Greece in the 14th to 13th centuries B.C., in Chinese literature found in Tibet in 1121 B.C., on runestones in Scandinavia, and on coinage in Denmark from the 5th century A.D. Regardless of its origins, the Great Dane was bred to be a hunting dog possibly descended from English Mastiffs and Irish Wolfhounds. This dog breed was originally referred to as the Boar Hound, as it was developed to hunt boars. However, its name was changed to "English Dogges" in the 16th century, and then to "Chamber Dogs" in the late 1600s to protect sleeping princes from cutthroats. These dogs were also bred in Germany, gracing the courts of the nobility in the 17th century, and in the 19th century, an attempt was made to change its name to "German Dogge" and "German Mastiff", but due to tensions in Germany the name did not come through. 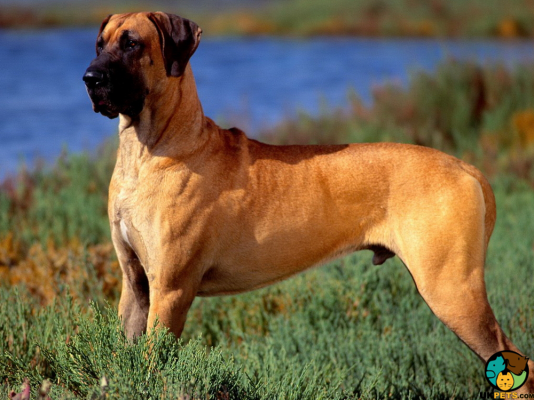 In the end, it was Comte de Buffon who successfully named the breed to "Great Dane" (as we know it today) when he travelled to Denmark and saw dogs resembling the Boar Hound. The Comte came up with the name because he thought the changes in the dog's appearance is due to the Danish weather. Most people assume the Great Dane originated in Denmark because of its name, but its long, albeit dubious, history says otherwise. The Great Dane first appeared in the UK in 1877 while the first breed club was established in the UK later in 1885. Today, the Great Dane is a popular choice as a family companion due to its loyal and friendly nature, apart from its stunning looks. Great Danes are massive, elegant and muscular dogs. They stand 71 to 81 centimetres at the withers and weigh anywhere from 100 to 200 pounds. Though they are enormous dogs, they should appear square in proportion, matching in length and height. Their heads are rectangular-shaped, muzzle broad and face chiselled, while nostrils are wide and open adding a blunt look to its nose. Great Danes have medium-sized ears that are high-set on the head and are often cropped or folded forward reaching the cheeks. It has deep-set eyes that are medium-sized and dark in colour. Its long tail should never be cropped and instead should taper to a point at the end. 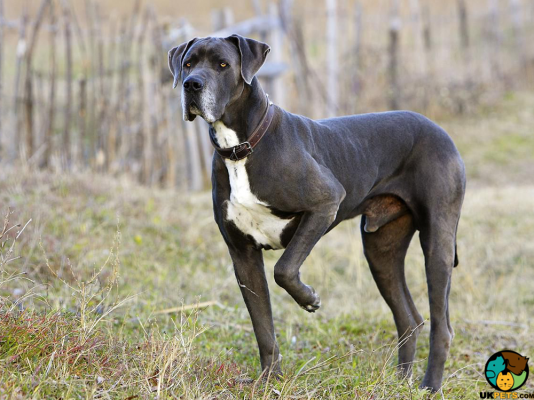 The short-haired Dane comes in numerous colours including brindle, black, fawn, blue, harlequin or mantle. Its short coat may fool you into thinking it is low-maintenance in the grooming front; it's not. The Great Dane is a heavy shedder since it wears its coat thick, although smooth to touch. However, some will argue that it sheds moderately except during spring and fall when it undergoes a shedding method called "blowing out." Regardless, the Great Dane must be regularly brushed with rubber hound mitt or soft bristle brush to keep its coat and skin healthy. Bathe the Dane when necessary. Use a gentle dog shampoo that is vet-approved since harsh shampoos can harm its coat. Brush its teeth at least twice a week, preferably daily, to remove the build-up of tartar and prevent any gum disease caused by infection. Trim the Dane's nails once or twice a month, especially if you can hear clicking sounds on the floor. Long nails can cause cracking and splitting, which is painful when it is caught in things such as your carpet or upholstery. Ears should also be checked regularly and cleaned to prevent ear infections. The Great Dane is a gentle giant with a natural instinct to protect when the situation calls for it. It is an affectionate breed and loves to be around people. Most people mistake the Great Dane as an outdoor breed because of its massive size. However, the opposite is true. This dog breed is actually an indoor dog who loves nothing than to laze around with its family and be involved in family activities. This does not mean that the Great Dane will not need enough space to roam, run and engage in other activities to express themselves. Being a large dog, the Dane is not ideal for families who live in small apartments or houses, unless there is a secure and spacious back garden. Danes are easy to housetrain as they are people pleasers and loving dogs. However, left alone to its own devices, this dog breed can cause all sorts of trouble to entertain itself. 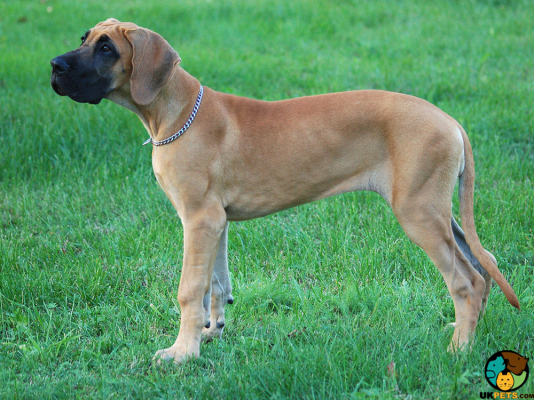 The Great Dane is best suited to families where one person stays at home. Great Danes love children and are good around them. However, Danes must learn how to be gentle and careful around them, especially toddlers, as one swipe of its tail can knock a toddler over. Strict supervision must be observed during playtime. When it comes to getting along with other pets, giant Danes can be trained to get along with other household pets, especially those that were raised with them. However, do not forget that the Great Danes were once bred to be hunting dogs, so they still have quite a high prey drive. They will happily chase smaller animals that they think to be fair game when given a chance. A typical serving for an adult Great Dane is 6 to 8 cups of premium dog food, spread over two meals – morning and afternoon. The amount to give your Great Dane will depend on its age, gender, size, activity level, health and metabolism. 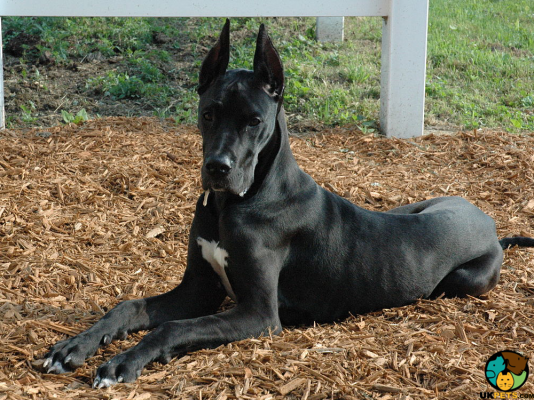 The Great Dane should be given a well-balanced diet opting for quality dog food suitable for a fast growing breed. This dog breed is prone to bloat and as such must not be free-fed. When you notice that your Dane is hungry, not long after its meal, best to give treats or snacks rather than another full meal. The Great Dane has a life expectancy of 8 to 10 years and can live this long if owners maintain its health. However, Danes can also suffer from genetic health issues and other acquired diseases. The following health issues must be brought to the attention of a veterinarian: Dilated Cardiomyopathy, Bloat/Gastric Torsion, Hip Dysplasia, Wobblers Syndrome, Addison's disease, Glaucoma, Osteosarcoma, Flea Allergic Dermatitis, Splenic Torsion/Twisted Spleen and sensitivity to specific anaesthetics. The Great Dane may love nothing more than to stay indoors, quiet and calm, but this dog also needs exercise. 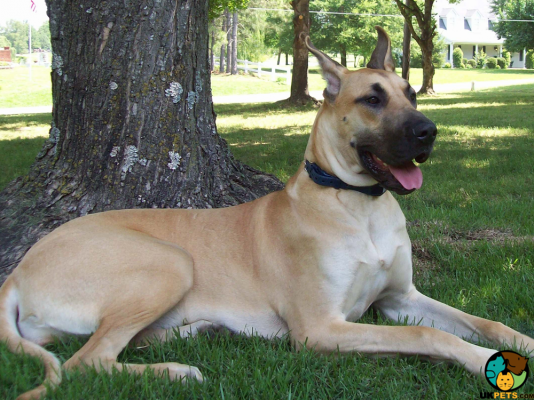 Take your Dane out for a long walk around the neighbourhood or a large secure yard to play in. An adult Great Dane will require at least 30 minutes of daily exercises, but this will depend on its activity level. Although this breed is not a jumper, make sure that the fence is at least six feet tall to prevent it from escaping. 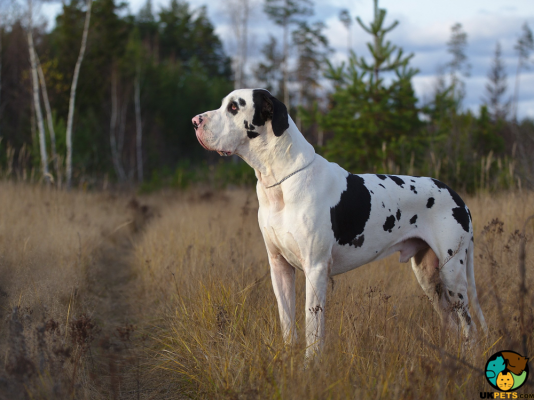 Considering that you are buying a large dog that has higher calorie needs and are predisposed to quite a few genetic disorders, the Great Dane is quite an expensive breed to care for. The price to buy a Great Dane puppy is around £600 to over £1000 while getting a pet insurance will cost you around £70 to £115 a month. Being a large breed, food costs will also be costlier compared to smaller breeds, setting you back £50 to £60 a month on high-quality dog food. On top of all these, let us not forget its routine veterinary consultations especially for preventive measures. In a year, you will have to spend up to £1,400 for these vet visits and other basic procedures such as vaccinations, boosters and neutering, when the time is right. Overall, caring for a Great Dane will cost you roughly about £120 to £180 a month. The Great Dane is among the tallest dog breeds. Underneath its imposing exterior is a gentle and kind dog. It is naturally protective and loyal to its family. Great Danes are people pleasers and are easy to housetrain. Danes get along well with children and other household pets.